Banking on our enriched industry experience, we are engaged in offering a huge gamut of Marine Equipment (New). We take into account the variegated requirements of our clients and offer suitable range of Marine Equipment (New). Our company is highly acclaimed in offering a wide range of External Communication Equipment - GP328. These are offered with an affordable one time fixed investment cost and no talk time charges. Motorola’s GP Series brings new level of productivity to the workplace. Small-to-large companies, in virtually all industries, use Motorola Two-Way Radio to get instant communication with people on the move. 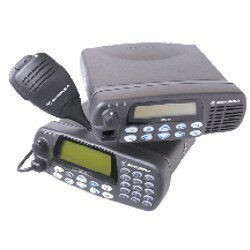 These are renowned for their unique features such as operate two-way radio to contact people who are mobile and are often away from their desk, to make several calls to repeat the same message, to manage a facility or more than one building, majority of your company’s communication needs are within the vicinity and to communicate within a close vicinity. 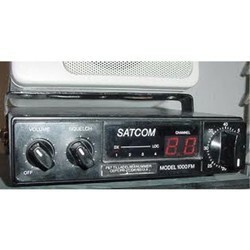 We bring forth an impregnable range of Radio Communication Equipment. 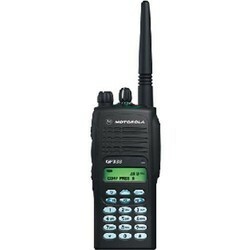 This is a Versatile Radio for those who need to communicate frequently with multiple work groups, to be on the move outdoor most of the time, to communicate in a high-noise environment, to co-ordinate law enforcement and emergency and constant up-to-the-minute information. 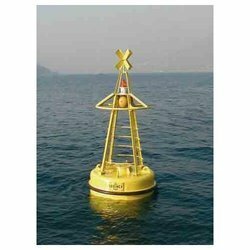 AIS Marine Equipment is the mariner's most significant development in navigation safety since the introduction of radar. The system was originally developed as a collision avoidance tool to enable commercial vessels to ‘see' each other more clearly in all conditions and improve the helmsman's information about his surrounding environment. AIS does this by continuously transmitting a vessels identity, position, speed and course, along with other relevant information to all other AIS equipped vessels within range. Combined with a shore station, this system also offers port authorities and maritime safety bodies the ability to manage maritime traffic and reduce the hazards of marine navigation. 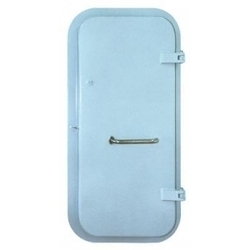 Hydrophore tank for ship & offshore use. 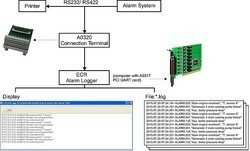 Alarm Logger is a parallel recording device designed to work alongside the current printed alarm history from the ships' automation printers. Alarm data is stored at the VL - Computer and can be retrieved for later viewing and evaluation. Even if the original printer is out of order, the VL-Alarm Logger will continuing recording, and when installed as part of the ship's LAN, stored files can easily be sent by email to the owner's office. Material of AC-14 HHP anchor: SC42. The AC-14 HHP stock-less anchor is our traditional and advantaged product with weight range from 25kg up to 20625kg. CB*286-84 Bar Type Chain Stopper is cast steel lever chain stopper that is commonly used to control the movements of anchor chain and reduce the load of windlass. It is applicable to AM1, AM2, AM3 anchor chain, which diameter ranges from 12.5mm to 68mm. This cast lever chain stopper is strictly produced according to the shipbuilding standard CB*286-84. 6.No cracks, air holes, scars or any defects to influence chain stoppers’ strength. 7.Lubricated friction surface and bitumen paint. 8.Qualified quality certificate and the certificates are CCS, ABS, BV, LR, GL, DNV, NK, etc. 9.Can be designed according to customers’ requirements. 1.Capacity: up to 200 tones. 2.Material: cast iron, cast steel, cast SG iron. 3.Color: depends on the need of dock. 4.Surface: high corrosion resistance, polished, galvanized. 5.Bolts quantity: 4 to 8. 6.Certificate: CCS, ABS, GL, etc. This series air compressors are mainedly used onboard ship to start the maine and auxilairy engine.The are directly driven by marine induction motors. 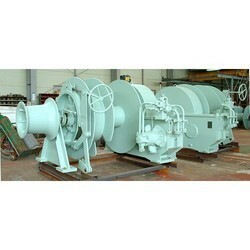 The air compressors are two stage, single cylinder compressor cooled by fresh water or sea water. Liquid-gas separators are fitted on each stage. The air compressors are rotated clockwise viewed from the driven end. 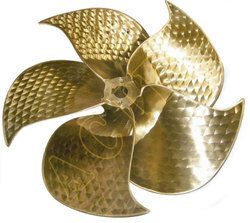 The range of fixed pitch propellers from ACIR are suited for a wide variety of pleasure craft applications including sport fishing boats, cruisers, motor yachts, as well as for many commercial applications. 6.Local control is available for customers. Driven Mode: Manual, Electric, Hydraulic and Diesel Engine Operated. Configuration, 1, 2, 3, 4 mooring rope drums, with or without chain wheel (gypsy, wildcat) and warping heads as per clients’ request. Safe Working Load: 1 ton to 100tons at first layer on each drum. Nominal Speed: 9-20m/min at first layer on each drum. Drum Capacity: Any rope diameter and length as per client’s request. 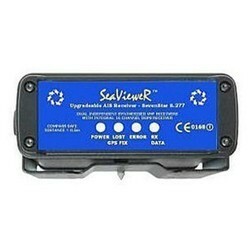 Certificate: CCS, BV, ABS, GL, LR, DNV, etc. Marine towing winch is known as the winch usually installed on a boat to tow another boat. It consists of drum, brake unit, clutch, wall frame, base, spooling device, drive device, control device and so on. It is mainly used to connect tug boat with the towed boat,bear the corresponding load, and meanwhile it also used to reel, release and store rope. Configuration: Single or double drum in horizontal or waterfall type. Drum Capacity: 100-2000m according to client’s request. 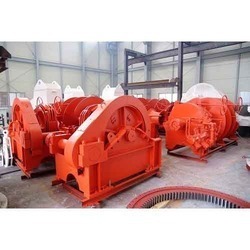 Warping Head, Auto-spooling device, load/rope out/speed monitoring system are available upon request. Available Certificate: Maker Certificate, CCS, ABS, BV, GL, LR, DNV, etc. The cranes are available in the range from 141 - 30000 KN.m lifting moment and are supplied according to customer requirements. 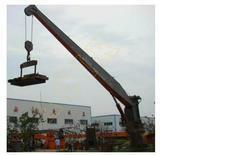 The stiff boom cranes can be delivered within a broad range of certifications and numerous optional features. Stiff boom cranes are typically used in dock,on fixed installations and in harbor conditions. Marine Anchor Chains has 2 grade: Grade 2 and Grade 3; We can provide 12.5m to 162mm marine anchor chains. All marine anchor chains can be tested by UT & MT detection and loading test, etc. 4.Surface treatment: Hot Galvanized, Black Painted. 5.Certificate: CCS, ABS, LR, BV, NK, GL, DNV, RS, IRS, etc. 6.Guarantee Period: 12 Months after ship delivery. CB*286-84 Bar Type Chain Stopper is cast steel lever chain stopper that is commonly used to control the movements of anchor chain and reduce the load of windlass. It is applicable to AM1, AM2, AM3 anchor chain, which diameter ranges from 12.5mm to 68mm. This cast lever chain stopper is strictly produced according to the shipbuilding standard CB*286-84. It meets the regulatory requirements of CCS, GL, LR, DNV or other classification societies. the most common rubber bumper mounted on ships or docks, boast higher energy absorption than cylindrical fender and reasonable reaction force. D fenders are extruded into small D-shaped structures with punched holes for easy installation and replacements. Normally, they are ideal for following applications: Tugboats, work boats, fishing boats etc. 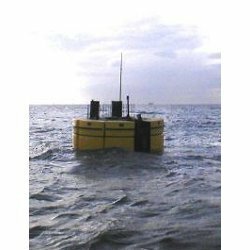 3.Especially suitable for frame type wharf and shore protection of the wharf.It can also be used in protection of vessel. Closed chock is one form of mooring chock which used to guide the mooring ropes. JIS F-2005 closed chock is made according to marine standard of Japanese standard association. JIS F-2005 is made of cast steel. Its surface is galvanized, polished and painted to be smooth, which can reduce the friction of the rope. Nominal Size: 100mm-200mm, 250mm - 500mm. Weight: 3.7kgs - 24kgs, 48kgs -232kgs. Available Certificate: CCS, DNV, ABS, BV, LR, RS, KR. Choice will depend primarily on the size of the vessel and the diameter of the lines. The quick release harbor type towing hook is especially designed for towing with steel wire ropes. 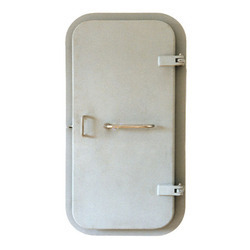 Derived from the proven mooring hook design the harbor type is also used as towing hook. The standard range harbor type towing hook is available from 15-100tones SWL. Higher loads are available upon request. 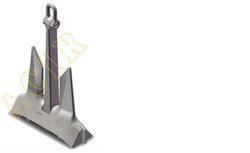 Spring towing hook is one type of marine towing hooks that are used for towing or releasing the mooring line. Marine towing hook is easy to operate and release the mooring line in a short time. It is more effective than marine bollards, which reduces the labor intensity and improve the labor efficiency, safety and liability. To meet customer’s different requirements, spring towing hooks have different types and sizes. We supply pneumatic release spring towing hook, manual release spring towing hook and other customized towing hooks according to your requirements. 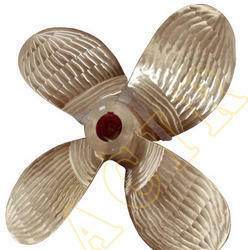 Fixed pitch propeller (FPP) is both cheaper and more robust than controllable pitch propeller (CPP). Also, an FPP is typically more efficient than a CPP for a single specific speed and load condition. Accordingly, vessels normally operate at a standard speed (such as large bulk carriers, tankers and container ships) will have an FPP optimized for that speed. 2.Material: Cu1, Cu2, Cu3, Cu4. 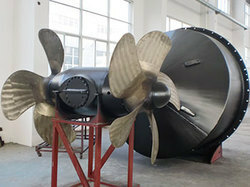 3.Propeller diameter ranges from 1000 to 8000mm. 5.Propeller weight is up to 100tones. On a power-driven ship, the propeller shaft usually connects the transmission inside the vessel directly to the propeller, passing through a stuffing box or other seal at the point which exits the hull. It usually can be used for many years. It ensures the function of vessel, so propeller shaft is a very important part of the propulsion system. 1. Material: Stainless Steel, Forged Steel, Alloy Steel according to clients’ request. 2. Test Method: 100% Ultrasonic flaw detection test. 3. Design and manufacture according to customer’s request and drawings. 4. Available Certificate: CCS, ABS, BV. GL, LR, DNV, KR, NK, IRS, etc. 5. High quality, with a competitive price. 6. On time delivery as per contract. As a driving shaft, propeller shaft will give vessels a huge thrust when sailing. So it plays an important role in the propulsion system. Bow thruster is a propeller mounted in tunnel at the bow below the waterline to make vessels maneuvered much easier. It can be powered by diesel engine, electric motor, or hydraulic motor. When fixed pitch propellers are used, electric and hydraulic motors allow the direction of thrust to be reversed. And an additional reversing gearbox is required if the thruster is powered by a diesel engine. 2.For continuous and short time service. 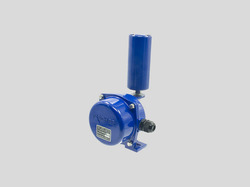 4.Compact design due to horizontal, vertical or inclined arrangement of the power input flange. 5.Combined with diesel engine, hydraulic or electric motor driven. 6.Available certificate: CCS, BV, ABS, DNV, NK, KR, GL, RINA, etc. Azimuth thruster with nozzle is a kind of Z type propulsion. It combines the function of tube propellers and steering gears. The part under water can steer by 360 degree free rotation. All directional propulsive force is formed. 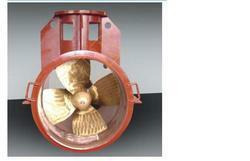 The device combines the highly efficiency of tube propellers and flexibility of azimuth thruster. Azimuth thruster with contra-rotating propellers combine the structure advantages of the contra-rotating propellers and the flexibility of Azimuth thruster. While providing All-directional propulsive force, the diameter of the propellers is shortened, the propulsive efficiency is improved, the vibration and noise is decreased effectively. A centrifugal pump is a machine that uses rotation to impart velocity to a liquid, it then converts that velocity into flow.Centrifugal type pumps are widely used in the sea water, fresh water system in ships. 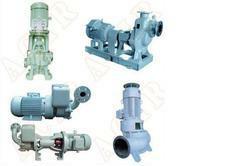 Centrifugal pump fpr maritime applications are usually driven by an marine electric motor or diesel engine. With suction height up to 7meters. In a rapidly changing market, you need a communication solution that enables you to respond immediately to your customer requests and maximise productivity. With Motorola GM338 and GM398 conventional mobile, you can now enjoy instant and reliable communication to keep your mobile team working efficiently. Whether you are a courier service personnel where information on direction is critical, or a police officer needing emergency backup at an accident scene, or a transportation company that wants to improve its fleet management, both the GM338 & GM398 mobile radios are solutions that let you stay in touch and in control. 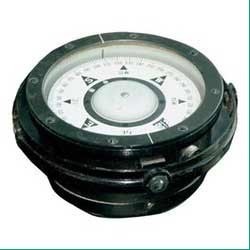 Owing to our experience, we have been successful in catering to the requirements of our honorable patrons by offering a comprehensive range of Marine Magnetic Compass. This range of marine magnetic compass is available in varied dimensions, sizes and other specifications in accordance with the diverse demands of the clients. 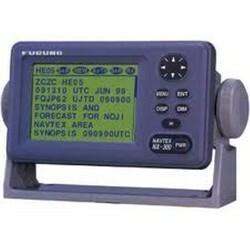 Furthermore, this range of marine magnetic compass is offered to customers at market competitive rates. 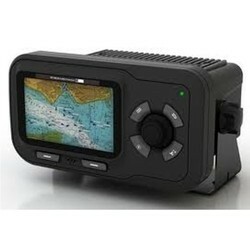 Looking for Marine Equipment (New) ?